Like all empires that of the Assyrians relied on military support from the subject peoples in times of crisis. Vassal kings would give a commitment to provide troops whenever the king called for them, and they would muster with both the professional Assyrian troops and the peasant levies, ready for the campaign. The soldiers in this set would seem to be a fair representation of some of the allies Assyrian kings could call upon to fight with them. They wear no armour except the helmet which has a crest, a feature that some Assyrians copied. The spearmen all have a bronze disc in the centre of the chest (called an irtu), but as usual the archers are much more lightly attired. To our eye we felt that the kilts were rather too short for the spearmen, and the same applies to the sword scabbards and archer's quivers, the latter in particular being much too short to accommodate the arrow the man is holding. Only having seven poses doesn't allow a lot of variety, but given that limitation the poses chosen are as good as any. In a familiar HaT tradition one figure has a cupped hand into which any of the separate weapons can be placed, although as this is not a ring hand gluing would be required. The separate items are a spear, axe, standard and mace (the mace is on the bottom of the axe and standard). 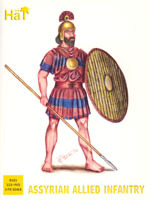 This is an officer figure (particularly if the mace or standard is placed in the hand), although with the spear he could also pass as ordinary infantry (if an officer then he would not normally have a shield so remove the peg). This set should be seen in tandem with the sister set of Assyrian Infantry from HaT, and like that set we have chosen to leave the shields off the figures to demonstrate the different types available. Of course those in the Assyrian infantry set could also be used on these figures. The shields have raised holes which fit onto pegs on the figure's arm. This is a very secure fit but does mean the arm is some way away from the shield - an inevitable compromise. Peg and hole could always be removed to make a more realistic model. As with the sister set, these figures are very well sculpted with lots of good clear detail. It is made in quite a soft plastic, which tends to mean long thin items like spears are prone to bending. However these are easily straightened and stay that way too, and by being soft they are not as prone to breaking as some sets. Another common feature of empires is that today's subject peoples and allies were probably once their enemies, so the figures in this set fulfil both roles depending on the date. Seven poses is not a lot, especially when divided between two troop types, but this is a solid enough set and a necessary partner to the indigenous Assyrians themselves.